After Jesus had spoken these words, he looked up to heaven and said, “Father, the hour has come; glorify your Son so that the Son may glorify you, 2since you have given him authority over all people, to give eternal life to all whom you have given him. 3And this is eternal life, that they may know you, the only true God, and Jesus Christ whom you have sent.4 I glorified you on earth by finishing the work that you gave me to do. 5So now, Father, glorify me in your own presence with the glory that I had in your presence before the world existed.6”I have made your name known to those whom you gave me from the world. They were yours, and you gave them to me, and they have kept your word. 7Now they know that everything you have given me is from you; 8for the words that you gave to me I have given to them, and they have received them and know in truth that I came from you; and they have believed that you sent me. 9I am asking on their behalf; I am not asking on behalf of the world, but on behalf of those whom you gave me, because they are yours. 10All mine are yours, and yours are mine; and I have been glorified in them. Protecting God, we praise you for the gift of freedom and unity that we have in Jesus. We thank you for the gift of your Holy Spirit who comforts us when we are sad, strengthens us when we are weak, and gives us the courage to reach out to all people in love and peace. Keep us generous in Your love, and forgiving by Your grace, through Jesus Christ our Risen Savior we pray. Amen. On this Memorial Day, families all over the country are likely setting up lawn chairs at parades, enjoying backyard barbecues, and perhaps even attending a more somber service of remembrance. National observances are always a little sticky for Christians, especially when the lines between patriotism and nationalism are so easily blurred. What message do we want our kids to take from these days on our calendars that, frankly, just can’t be avoided? How do we attend to this very public day in our country in a way that honors our allegiance to Christ above all? Well, this week in the liturgical year we will celebrate another kind of Memorial Day — remembering the day of Ascension, when the Risen Christ went up to heaven, returning to the fullness of His glory until he comes again. 10 days after Ascension, our remembrance continues as we give thanks and praise to God for Pentecost, and the pouring out of God’s Holy Spirit in wind and fire, empowering and equipping Christ’s people to be his Body in the world. Being the Body of Christ — the church — means that our call is always to bear witness to the hope, strength, protection and freedom that is ours in Christ and Christ alone. While parades and memorial services abound today, celebrating national freedom and remembering those whose lives have been lost to the atrocities of war, we have a wonderful opportunity to intentionally teach our children — and be reminded ourselves — of those sisters and brothers who have gone before us in the faith and fought the good fight; those who have offered their lives as living sacrifices to God, and endeavored to embody in word and action, the true freedom and security that only God can give. The prayer of Jesus is that we would be one as God the Father, Son and Holy Spirit are one, united in every time, place, country and circumstance, by the sacrificial love of God in Christ who came that allpeople, of all nations might know true freedom and peace. While you’re enjoying the three-day weekend, perhaps flipping burgers and munching on watermelon, enjoy making a fun craft with your kids. Below are two links to make either a pinwheel or a windsock. 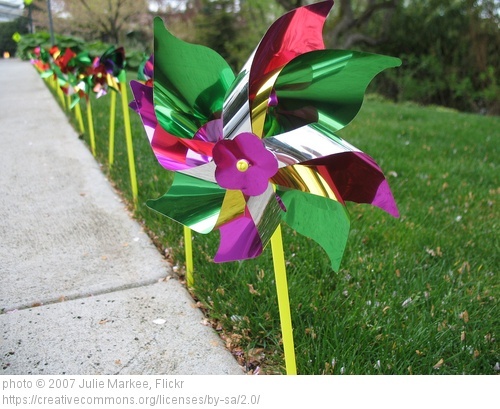 If you choose a pinwheel, kids can write on each pointed section, a freedom that they enjoy because of Jesus. If you choose to make a windsock, you can write on the tails of the sock. Because of the Risen Christ we are free to…love, share, pray, hope, be ourselves, take risks…etc. Because of Risen Christ we are freed from…fear, shame, worry, death…etc. Kelly Pittman, an ordained minister in the PC(USA), lives in the Port Huron area of Michigan where she shares life and ministry with her husband, two young children, and 1 lazy old chocolate lab. She enjoys writing, preaching, making things from scratch that you could just as easily buy at the grocery store, and drinking strong coffee with real cream and maple syrup.